All things considered, this was an extravagant claim to make on behalf of Greenwald’s valour and integrity, particularly at Charlie Hebdo’s expense. Greenwald – formerly of Salon and the Guardian and now co-founding editor at Pierre Omidyar’s campaigning blog, the Intercept – is most famous as the journalist to whom rogue NSA employee Edward Snowden leaked a vast cache of national security information before finding sanctuary in Putin’s Russia. Eisenberg stated that it was for his work on this story that she was recommending him as an honouree. The history of human knowledge is nothing more than the realization that yesterday’s pieties are actually shameful errors. It is constantly the case that human beings of the prior generation enshrined a belief as objectively, unchallengably [sic] true which the current generation came to see as wildly irrational or worse. All of the most cherished human dogmas – deemed so true and undeniable that dissent should be barred by the force of law – have been subsequently debunked, or at least discredited. How do you get yourself to believe that you’re exempt from this evolutionary process, that you reside so far above it that your ideas are entitled to be shielded from contradiction upon pain of imprisonment? The amount of self-regard required for that is staggering to me. Reading this, it would seem logical to suppose that Greenwald’s solidarity with the staff of Charlie Hebdo could be taken for granted. The magazine has, after all, dedicated itself to mocking religious and political pieties, and its attackers, Chérif and Saïd Kouachi, were surely guilty of the self-regard for which Greenwald expresses such vehement contempt. They considered themselves to be emissaries of God, no less (or – more directly – His fanatical, self-appointed earthbound representatives in Yemen), and sought to shield their beliefs from precisely the kind of criticism and ridicule which eventually cause such cherished dogmas to collapse. Instead, as Sam Harris noted, the blood had scarcely dried on the walls of Charlie Hebdo‘s offices before Greenwald published a furious article at the Intercept, reviling the magazine for its alleged racism and pouring scorn on its defenders. That his misreading of Charlie Hebdo demonstrated a profound ignorance of their material and a dismal inability to parse satire ought to have been beside the point. After all, as Greenwald was at pains to remind his readers, he has spent much of his life defending the freedom of people to express views he abhors. But while he was careful to include a perfunctory, throat-clearing defence of Charlie Hebdo’s narrow right to ridicule Islam, Greenwald’s more pressing concern was the denigration of people murdered for publishing cartoons offensive to their assassins. More telling still was the corresponding absence of any criticism of Al Qaeda’s pitiless death squad. Beliefs held to be unchallengeable by Islamic fundamentalists (but wildly irrational by the rest of us) were, it seems, to be exempted from the evolutionary process after all. This is all because Greenwald’s commitment to free speech is subject to a couple of slippery caveats, which make it rather more porous than he likes to pretend. He had hinted at Caveat One with a couple of lawyerly qualifications buried in the paean to counter-orthodoxy quoted above. Dissent, he had argued, should not be barred “by the force of law” nor ideas shielded “on pain of imprisonment.” In other words, as far as Greenwald is concerned, the only meaningful kind of censorship – and the only kind worth opposing – is that mandated by the state, thereby excluding the kind imposed by terror and carried out by non-state actors like the Kouachis. But the French state – which makes a clear distinction between anti-clericalism and racial hatred – did not share Greenwald’s assessment of Charlie Hebdo; the magazine has never fallen foul of France’s hate speech laws, the very existence of which Greenwald denounces as unacceptably draconian. As it happens, I agree with Greenwald that state-sponsored hate speech laws are deplorable and reactionary, no matter how well-intended. But at least Levant is still alive to speak in his own defence. And in democracies like France and Canada, court verdicts can be appealed and overturned; bad laws can be repealed; and journalists like Greenwald can inveigh against those responsible for both from their pulpits at Salon and the Guardian. Why then does Greenwald’s stomach also not churn for the victims of state censorship in, say, Russia, Venezuela, Iran, or the Palestinian territories? Journalists in such states enjoy none of the rights and protections afforded by liberal democracies, and yet, on the subject of state repression in unfree societies, Greenwald is conspicuously silent. This brings us to Caveat Two, which is that Greenwald’s governing principle is not the absolute defence of free expression, but an absolute opposition to democratic governments, which he presumes to be motivated by authoritarianism, mendacity, and self-serving hypocrisy in every instance. For Greenwald, Western power and Zionism are the only enemies worthy of his critical attention; forces of unparalleled cynicism and cruelty against which all resistance, no matter how vicious and sadistic, must be indulgently understood. [Charlie Hebdo‘s] messaging – this special affection for offensive anti-Islam speech – just so happens to coincide with, to feed, the militaristic foreign policy agenda of their governments and culture. By the same token, Greenwald may be wholly ignorant of Mali’s history and politics, but once the French government announced military intervention there to halt jihadist violence, his position on the matter was as entirely predictable as it was entirely uninformed. I have never found any reason to suspect that Greenwald is remotely interested in understanding the complex considerations that inform Western foreign policy decisions. Nor have I found any reason to suspect that he is interested in investigating or understanding Islamist ideology. He finds it more convenient to prejudge the former as invariably malevolent, and the latter as invariably reactive. Such reductionism has the benefit of being instantly applicable in any given scenario, thereby removing the need for reflection, informed analysis, and independent thought. But it also comes burdened with considerable dangers, not least among which is the corollary belief that anyone attacking the West by word or deed is doing so with good reason. And this assumption has frequently left Greenwald well-disposed towards the arguments of authoritarian governments (so long as they are enemies of the West) and non-state actors hostile to the whole notion of liberal democracy. Greenwald is never less than proud to acknowledge the considerable time he has spent as a litigator and writer defending the right of neo-Nazis to air their views. For a truly principled free speech activist, there would be no shame in that. But his condemnation of their beliefs often feels somewhat pro forma, and certainly pales next to the contempt he expresses for their enemies. In 1999, for instance, a member of Matthew F. Hale’s white supremacist World Church of the Creator went on an interstate shooting spree that left two people dead and nine injured. A New York-based NGO called The Centre for Constitutional Rights filed suit against Hale and his Church on behalf of one of the victims, alleging them to be partly culpable. Explaining his decision to represent Hale, Greenwald objected that “all [the complainants] can say Matt Hale did is express the view that Jews and blacks are inferior. There’s just no question that expressing those views is a core First Amendment activity.” Well, okay. But, gratuitously, he then added: “I find that the people behind these lawsuits are truly so odious and repugnant, that creates its own motivation for me.” Hale, incidentally, was later convicted of attempting to solicit the murder of a district court judge and sentenced to 40 years in prison. I sometimes get the feeling that Greenwald – an openly gay Jew – harbours a not-altogether grudging respect for unapologetic fascists. He sympathises with their marginalisation just as he would with any underdog; but he also seems to find their ideological certainty appealing, even if every dot and comma is not exactly to his taste. And he has sympathy to spare for any professions of hatred for Israel, no matter how inflammatory or defamatory those professions may be. What followed was a gruesome selection of cartoons, not one of which could reasonably be described as blasphemous or anti-clerical, and every one of which relied upon classical antisemitic conspiracist tropes about malevolent Jewish power and influence. Thank You Mr. Greenwald for being courageous enough to dare to expose hypocrisy and racism wherever it is found even among the chosen few [who] have enormous power. Duke’s use of the term “chosen” here was not, I suspect, accidental. When Greenwald complained in his article that Charlie Hebdo had fired a cartoonist for antisemitism, or when he protested on twitter about the arrest of the Holocaust denier Dieudonné M’Bala M’Bala, there was little evidence he felt their racism merited much in the way of condemnation. On the contrary, what really bothered him seemed to be the suspicion that Jews were getting special protection they did not deserve. In an ugly coincidence, Greenwald’s Intercept article appeared on 9 January – the same day that the Kouachi brothers’ associate, Amedy Coulibaly, murdered four Jews in a Parisian Hypercacher kosher food superette at Porte de Vincennes. Given Glenn Greenwald’s prodigious contempt for the West, his impulsive sympathy for its enemies, and his generous indulgence of Jew hatred, his emergence as one of America’s most vehement Islamist fellow travellers was a forseeable development. And it is in their name that he has offered some of his most passionate arguments for free expression. I believe history will be quite clear about who the actual criminals are in this case: not Mehanna, but rather the architects of the policies he felt compelled to battle and the entities that have conspired to consign him to a cage for two decades. I rather doubt that, although time will tell, I suppose. But Greenwald then went even further and described the statement Mehanna delivered at his sentencing hearing (a masterwork of bad faith which he reproduced in full) as “incredibly eloquent [and] thoughtful.” It was, he enthused, “something quite amazing.” While Greenwald had taken care to record his disgust with Ezra Levant’s neoconservative views as he defended Levant’s right to express them, Mehanna was not just exonerated but eulogised without equivocation. That Levant is a democrat, while Mehanna is the footsoldier for an antisemitic totalitarian ideology counts for little, it seems. 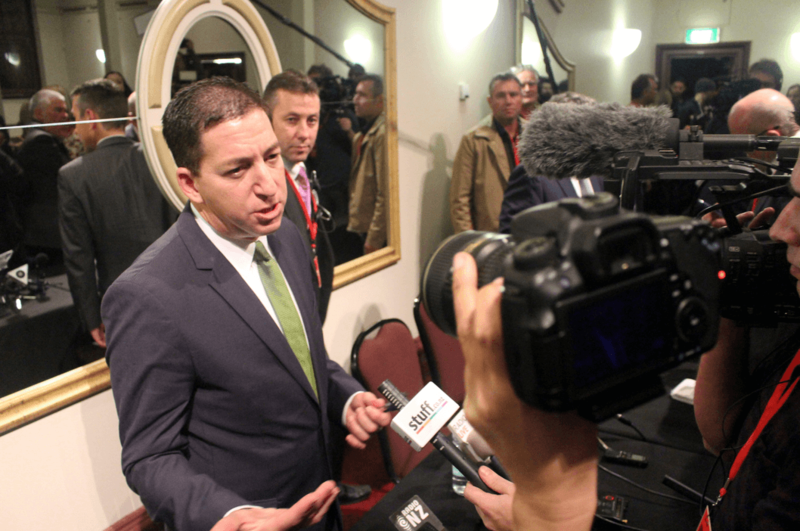 Beholden to a worldview in which Islamists are only victims and never victimisers, Greenwald preferred to assume that because Mehanna also loathes American foreign policy and the Zionist entity, and because he also considers liberal democracy to be a hoax, he is in fact an ally of some description. So what then are we to make of Greenwald’s involvement in the Snowden leak, for which Eisenberg insisted he be honoured at the expense of the Charlie Hebdo dead? It is possible, I think, for reasonable people to disagree about the value of what Snowden disclosed, and the merits of his actions. But any serious assessment of either needs to take account of the enormous harm done to American credibility, diplomacy, and security as the US government struggles to contain the spread of jihadist terror and to defend its soldiers and citizens. The most generous reading of Snowden’s actions recognises this as collateral damage inflicted in pursuit of a greater libertarian good. But Glenn Greenwald will make no such allowance. On the contrary, he has taken undisguised satisfaction in the havoc Snowden’s NSA leaks have caused, not least because he believes that the war on terror presently being waged against jihadist fanatics like Tarek Mehanna and the Kouachi brothers is a monstrous injustice. In the ongoing battle between democracy and religious totalitarianism, Greenwald has defiantly taken the side of the latter. So, Greenwald’s condemnation of Charlie Hebdo‘s murdered staff was – like his position on pretty much everything – tediously predictable, and it rested on a refusal to perceive the rather large difference between fascism and its antithesis. For someone who postures as a First Amendment absolutist, this is a considerable moral failure. But Eisenberg nominated Greenwald in Charlie Hebdo’s stead, not in spite of such views, but precisely because of them. In their own minds, the PEN dissenters were taking a courageous, principled, and nostalgic stand: courageous in its refusal to be swept along by liberal moral orthodoxy; principled in its rejection of sentimentality; and nostalgic in its defiant celebration of 1968’s once-uncompromising anti-Imperialism. It didn’t matter that many of the murdered staff at Charlie Hebdo were themselves soixante-huitard veterans of the New Left, nor that they had retained the New Left’s anti-authoritarianism, its reflexive sympathy for the Palestinian cause, and its hatred of the unreconstructed nationalist far-right. For their refusal to qualify their mockery of radical Islam with an acknowledgment of its value in the fight against Zionism, Western racism, neoliberalism, foreign policy, and all the rest of it, they were deemed guilty of selling out their own radical spirit of ’68. And for lending their assistance to a ‘narrative’ (as one of the PEN dissenters termed it) that serves a baleful Western agenda, they were denounced. The idea that Glenn Greenwald knows anything about the spirit of ’68 fills me with scepticism. I suspect he could hardly care less. But his inchoate rage against the West was useful to Eisenberg and her allies even so. Greenwald may be applauded by the likes of David Duke for circulating Jew-hatred; he may defend theo-fascists and neo-Nazis and denounce their opponents with rather more enthusiasm than is either seemly or necessary; and he may observe a shabby silence about the repression of dissent in authoritarian and theocratic states. But he may be judged to have “fastidiously exercised his courage for the good of humanity” just the same because, like Deborah Eisenberg and the rest of the self-regarding PEN dissenters, what actually fires his perverse moral disgust is not the threat to liberty and free speech posed by lethal theocratic terror, but the war being waged by the West to defeat it. Thanks. You express very eloquently what I have always felt about Glenn Greenwald when he used to write for The Guardian propaganda platform. Nonsense. Charlie Hebdo, these supposed anti-authoritarian free-speech activists you venerate wanted to ban the Front National Party and holocaust denial. Charlie Hebdo didn’t deserve the PEN award, not because they supported “racism” or “bigotry”, but because they didn’t actually support free speech. The whole Je suis Charlie phenomenon from start to finish was an exercise in ideological hypocrisy. Free speech for me, but not for thee. Fine, but why was Greenwald worthy of being given the award? Charlie Hebdo’s status as a free speech defender seems utterly beside the point here. This piece is about Greenwald, and Greenwald’s point wasn’t that CH wasn’t a strong enough advocate of free speech, but rather that they were bigoted. In criticizing Greenwald, Jamie Palmer defends Charlie Hebdo by making dubious claims about the supposed anti-authoritarian nature of the publication. This is quite convincing, but what is the cause of this one-dimensional rule, the ‘inchoate rage against the West’, blaming all on imperialism? Leftists are accused of treating all conservative opinion as if it comes out of some kind of pathology, or repression, or childhood abuse, and that only leftwing opinion is normal and reasonable. What is the conservative opinion of the roots of leftwing opinion? ie the emotional roots and intuitions of it. We don’t want to return the accusation..
It’s one thing to say that Leftists can’t bear, & put a high premium on, not hurting or upsetting anyone, or on having equal outcomes for everyone (hence anti-capitalist). But while not indulging much in them, they have great deference for conservative values like authority & sanctity, when exhibited by Muslims, yet scorn when exhibited by, say, Western Christians. I can’t figure it out. The rules of the ‘progressive stack’ feels like a very inadequate explanation. The left’s actions can be explained simply by respect for human rights, and a desire to increase their application. Not having equal outcomes or avoiding hurting or upsetting anyone; just basic fairness. This is of course a generalization with all the caveats that always apply, but as a leftist I’d say it’s broadly accurate. The reason much of the left acts differently (and contradicts that principle) with regard to Islam is because the left has thoroughly embraced identity politics, which elevates the victimhood of groups above all else. Muslims are not only a victimized group but are victimized in two ways: as a “race” (yes, I know), and as a target of U.S. foreign policy. And the combination of the identity victimhood and foreign policy victimhood of its adherents puts Islam beyond criticism. Personally I oppose anti-Muslim bigotry and U.S. wars in Muslim countries, but I see no contradiction in also criticizing Islam. But many liberals believe that any criticism of Islam, even if valid, will just effectively support bigotry and war. “Blaming all on imperialism” is just a standard human failing: having a hammer and seeing everything as a nail. Sam Harris and some others are in my view far worse on this, since they treat religion as the sole or nearly-sole cause for so much behavior, often ignoring clear evidence to the contrary reach that conclusion. Obviously the U.S. has tremendous economic and military power that it exercises throughout the world, so it’s no surprise to find it at or near the center of much of what happens, and it makes no sense to deny or minimize that. At the same time, obviously religion has a powerful effect on individuals and informs their actions even when it isn’t their primary motivator, and it makes no sense to deny or minimize that either. The truth lies somewhere in the middle. As Sam Harris has repeatedly said, there is nothing about having an honest conversation about the connection between ideology and violence in the case of Islam that denies all of the most terrible consequences of American imperialism. And he continues to act as though the fact that Russia and France were attacked by ISIS carries no information whatsoever, despite the fact that these two countries were actively bombing ISIS. There’s no denying that ISIS is a religious organization with religious goals (but Greenwald does so anyway). There’s also no denying that ISIS is a political organization with political roots and political goals (but Harris ignores that anyway). As I said, the truth lies in between. In Islam, politics and religion have no distinction. There is no separation of mosque and state. Totally untrue. Sam regularly refers to the phenomenon of political Islamism – he just thinks it’s motivated, at bottom, by theological ideas/beliefs, rather than political ones, and I wholeheartedly agree. It’s a religious death cult, no doubt – but they also want to spread a global caliphate, which is by definition political (they want to take over the world and have a world wide Islamic caliphate, ruled by Sharia law). But WHY do they want this? Is it because of foreign policy? Is it because of rational grievances? The answer, of course, is a rather obvious no. The idea of a global caliphate is explicitly religious – they think they are doing the work of Allah. If you lose sight of this, then you’ve lost the plot. Human rights has got out of control though – too wide, too elaborate, doleing out lots of positive rights, too universal. So it is about equal outcomes, and in that it doesn’t judge whether a thing is earned or deserved, it’s a step towards identity politics: it strips people of individuality before it rewards them. It also lacks any sense of the sustainability of the world it ushers in. I want to know where the Left’s sense of proportionality is, or its sense of caution. Maybe it’s just the distance from any direct experience of war and want, on home ground, that weakens national loyalty, creates a desire for radical ideas and a blithe optimism that they’ll work, & so fashionable theories, such as universal rights, grow into excessive forms. If you feel rights are “too universal” and dismiss the notion of universal rights as no more than a “fashionable theory”, that definitely explains why you’re confused about the left. 🙂 The reality of universal movement, and other realities, has caught up with the abstract theory of universal rights. It looks like the rights are going to come off worse. I’m calling a fair-weather theory a fashionable one. And I am confused – if GG is sincere, if he’s holding it together effortlessly, then it’s confusing. He doesn’t say (maybe he does sometimes) ‘I know this is a massive compromise, but in the interests of X we have to support this b;stard Y’. But, I’m partisan myself, my loyalties start at home and don’t stretch that far. But has everyone forgotten that Islam was quite the Imperialist for THOUSAND of years!!!!!! Jesus Christ how the f*ck do you think 3/4 of Africa is Muslim? They gave us sweeties!!! But the bad white man ate our souls?? Until you White middle class Left AND Right wing intellectuals have an accurate conversation about HISTORY,the Left will continue to cause havoc with these fallacies. I despise the foreign policy in the ME just as much as I despise the Saudi’s for allowing it to happen at the first place. I deplore what is happening to the Palestinians but wonder where are the Jews supposed to go? And if you all give so much of a damn about people taking what is not there’s,why do you have no words for the Arabs in North Africa? Anyway,long and short of this article is that Greenwald hates the Jews. It’s interesting because many of the biggest opponents to Jews in general…are Jewish. I’m a secularist, an atheist, and I believe human rights should be given priority to any other interests, including religious/cultural ones. I don’t agree with Greenwald, or people like Noam Chomsky. But I find Sam Harris and several other in his club, like Ayaan Hirsi Ali, to be equally wrong. They generalize Muslims, lump them together and accuse them collectively of being incapable of anything other than a herd-like sychopathic group think. They ignore the abundance of history of Muslims, believing Muslims, seeking the realization of liberal goals – secularism, free speech, human rights. Christopher Hitchens, when asked about the Muslim response to the fatwah against Salman Rushdie, pointed out the many Muslims within Iran who, at great risk to themselves, stood up in defense of Rushdie. Similar voices have been present throughout the Muslims world – though Harris and Ayaan would have you believe they don’t exist. I’m all for hard truths. And the Muslim world needs to get its act together. But the situation isn’t improved by demonizing Muslims as a whole. And there’s plenty in the writings and sayings of people like Sam that affirm the worst stereotypes of the extreme far-Right. Not only are such comments harmful and offensive – they’re untrue. I was Muslim. I’ve been to many Muslim countries. The struggle between modern liberal thought and archaic salafist ideology is real. We need to side with those who promote liberal views, without trashing those people and demanding that they renounce their core faith, or pretending they entirely don’t exist. Sam Harris wrote a book with a Muslim trying to reform Islam, so how can you say he’s lumping them all together? Both he and Ali are saying the same thing as you: Support the liberal Muslims wherever they are. Have you read any of Sam’s or Ayaan’s books? It is remarkable to me you would accuse them of generalizing about Muslims and lumping them all together when both of them have gone through great pains to distinguish between the people and the ideology. Sam has gone into great detail explaining the spectrum of beliefs and the extent to which people believe things and are willing to act on such beliefs. Both Harris and Ayaan both have recently published books that flatly contradict your assessment. Good comment, and you rightly point out the internal conflict within the Muslim world between salafism and secular liberals like yourself. But you aren’t quite right about Harris, here. Even a quick look at Harris’ twitter feed will show endless tweets and re-tweets, where Harris endorses precisely the kind of pious, liberal, secular Muslims who you point out are necessary to challenge theocracy and illiberal conservatives. To name a few who he has endorsed, interviewed or collaborated with on numerous occasions: Asra Nomani, Maajid Nawaz, Maryam Namazie (feminists, liberals, believing Muslims, all), as well as atheist former Muslims such as yourself, like Ali Rizvi. In his books, as well, Harris goes to great lengths to point out that it is, in fact, liberal-minded Muslims, as well as women, homosexuals and apostates, who suffer the most under conservative theocratic regimes in some Muslim countries, and who suffer much more gravely than Western terror victims. While you are right overall, Maryam Namazie is now an atheist, and describes herself as an ex-Muslim. Can you give an example of Sam Harris lumping generalising Muslims? Or have you just fallen for that meme that he does so without any actually instances of it? Echoing some of the other comments here. There is a rogue’s gallery of people, Greenwald included, who want you to believe that people like Sam and Ayaan are constantly demonizing Muslims in a way that is bigoted or racist. It’s jut not true. Hey I think you misinterpret what views Sam Harris actually has on Muslims as a whole. He has stated (at nauseam) that the majority of Muslims are harmless moderates, he has even wrote a book with a moderate Muslim. Also, he openly states his concentric circles of Muslims clearly pointing out that there are differences between Jihadists, Islamists and moderate Muslims. I do not think you are intentionally misrepresenting Sam Harris but rather maybe have just seen some things taken out of context of him, I would urge you to visit his website http://www.samharris.org, or listen to some of his talks with Maajid Nawaz on youtube to get a better understanding. Ibrahim, those demonising Muslims as-a-whole are only prominent because of multiculturalism & the extreme deference shown to mainstream Muslim opinion on Sharia law, & so on. & globally the Muslim mainstream is, to us, pretty radical. It’s the pressure caused by supressing debate which propels these voices out of the bottle. & some actually have experienced the worst of Islamic culture for themselves, & so are highly motivated. Ayaan & Sam Harris are themselves demonised (stop watching the Young Turks!). I think Ayaan would be less forthright had she not been hounded by Leftwing apologists, she might be talking moderately by now. But this piece is about a general hate of liberal democracy – Islamism is just the current oppositional peg GG is hanging his hat on. The quote of GG in the middle of the article is shocking .. This is the most simplistic idea of science taken as a model for society: Einstein bettered Newton, therefore every current theory is destined to be superceded, & is therefore wrong at this moment. This is a spectacularly well-researched, incisive and effective take-down of the contemptible useful idiot Glenn Greenwald. This article screams of American exceptionalism and those pointing out the constant hypocrisy of western powers of course must walk hand in hand with theocrats and despots. The US and its allies run a global drone bombing campaign where 90 % of those killed are innocent bystanders but of course they are honest mistakes and foibles while ‘their’ crimes are terrorism most evil. The US bombs a hospital for around an hour but of course it must have been an accident and an internal investigation will be carried out that proves no one was at fault. Jim crow style racist cartoons are vile, anti-semetic cartoons are vile but anti-Islam cartoons must be defended for reasons of free speech and those who point out this inherent hypocrisy are of course terrorist sympathizers no matter how many times you condemn the violence. People like Greenwald and Chomsky point out this hypocrisy which occurs again and again but that does not mean they condone or side with the tyrants and despots. We know to be an honest journalist in Russia or Iran could mean prison or death. Iran is a brutal, repressive, theocratic, despotic regime and here comes the but… Saudia Arabia is more tyranic, more despotic, more cruel, as cruel as ISIS could ever be but they are the biggest Muslim ally of the west! It’s the hypocrisy of it all!! if the US wanted to just definitely kill all its enemies, regardless of any bystanders, it would be done. Iraq would be empty, and the US military would have suffered no casualties. They take extravagant care, not for PR or because they’re hypocrites, but for their exceptional constitutional values. Yes there is hypocrisy – it comes with everybody’s – yours too – desire for comfort and work. If push came to shove, you too would fight for oil and ally with whoever could get it. It’s not so all one-sided though. There are differences in intention, and they matter. The ISIS barbarians strategically picked young, pluralistic Parisians to slaughter in cold blood. The Kunduz hospital bombing was obviously a tragedy, but it was an accident. When the US goes out of its way to murder random Muslim non-combatants on purpose, you might have my attention. If that was our intention, we would have carpet bombed the whole Middle East by now. The very fact you are posting this through electronic medium tells me you are a raging hypocrite. Hypocrisy should be avoided, but their are worse things, like actually establishing a horrific theocracy. Greenwald is right to call out those on the right in the US who are bumbling is on that direction, but for some reason has no problem locking arms with people who are actively establishing it through violence. Nobody is saying that islamophobic cartoons are good or desirable, although we might disagree over your characterization of Charlie Hebdo, but the difference is that some people are making excuses for murdering people who made cartoons. The content of the cartoons doesn’t matter in this moral calculus. HA HA, joke’s on me. Good job Sean, you nailed the basic template of the stereotypical Regressive Leftist. Had me fooled on first read. Lol. Is it regressive and backward talking to say that the US drone attacks kill multitudes of innocent people? Or is it regressive to discuss the hypocrisy of the government of US, UK Aus? You have an interesting use of the term there. But I think what you call regressive thinking is thinking you disagree with. Sean’s comment above hits the nail on the head. And Sam supporters, like Sam himself, like to excuse the terrorist acts of the US because of “intentions”. Intentions matter, but Sam (and his supporters) seem to think the intentions of the west are good. “The government has good intentions” you say, while it kills (people you don’t know) on a mass scale. Read Andrew Wilkie’s book about why he blew the whistle on the Howard administration when Bush, Cheney, Blair and Howard were getting everyone heated up for war in Iraq. Then come and talk about intentions. Greenwald criticizes the actions of the US, UK etc. Sam ignores these for the most part. Sure he pays a bit of lip service. But that’s about it. Which is why Maajid’s discussion with him was so important. Sam misrepresents Chomskey’s views just as much as Sam claims others are misrepresenting his views. Funny that. Glad to see I’m not alone to see through Glen’s BS. He is the human embodiment of hypocrisy and cognitive dissonance, And it’s dangerous. Many many people have died because of his blanket protection of Islamist and many many more will die. The blood is on his hand. More people needs to speak out against this bully. Greenwald seems so immersed in his ideology, that he is incapable of being even partially objective and is a true hater, apologist and hypocrite of the highest order. Seems he’s got the libertarian disease, wherein only the state is the problem. This makes him a bit unlike many on the multiculturalist left who’d never dream of defending white supremacists, for any abstract purpose or greater goal. I learned much in this article. Thanks. Exactly right. Greenwald is a single issue pundit-dummy. Anti-state, anti-west, period. That’s hjs entire platform. He has no interest in truth or justice. West = bad and F anything else. He operates like a 19th century newspaper propagandist and it’s not working. We have access to all of the information these days. Thinking people think, and that’s antithetical to Greenwald’s whole program. Right on Jamie! Expose these regressives, they are taking us all backwards in a very bad way. The author has put on a masterclass in projection. Well done piece. Just wonder if we would be better off ignoring nutter Greenwald altogether. Seems to me that Palmer grossly misunderstands Greenwald’s ideology. In my interpretation, Greenwald consistently attacks governmental trafficking in propagandist ideas, examples of governmental hypocrisy and mass media’s tendency for unquestioning support of such practices and condemns various forms of racism and bigotry. Palmer notes that “More telling still was the corresponding absence of any criticism of Al Qaeda’s pitiless death squad. ” This is nothing more than the ridiculous old fallacy that speaking out on some given topic A and not on some other topic B, implies support for topic B – which of course is a ludicrous proposition on its face. The focus of Greenwald’s commentary on the Charlie Hebdo events was one, to protest the elevation by government leaders of what any objective observer would classify as bigoted speech and two, to point out that the speech which they so ceremoniously rushed to protect was in fact bigoted. Palmer then notes that in one instance Greenwald “was complaining that ‘some of Charlie Hebdo‘s cartoons were not just offensive but bigoted’ ” and he then correctly surmises that “Had the French authorities shared this judgement, Greenwald would doubtless have ridden to the magazine’s defence.” Does Palmer actually not understand the fundamental value of uncensored debate as the most credible mechanism for testing the viability of ideas? In short, Palmer’s critique, being completely void of factual, rational analysis, is nothing more than an attempted smear campaign based on irrational distortions. The point of the Greenwald article (as apparent to those who bothered to read it) was merely to point out that venerating the notion of free speech doesn’t been that you have to celebrate the content. His point was that many news outlets were celebrating both the right of free speech and the content of it. He in no way condoned the attacks (actually he condemned them in the first paragraph) and reiterated the fact that we need to support free speech, even if we hate it. I hate the content of Westboro Baptist’s free speech and recognize it as ignorant and bigoted, but I recognize their right to say it.